In the winter of 1925, University of Michigan excavators working at the site of Karanis in Egypt made a rare discovery: pieces of Roman armor made of leather. The armor is made in a style called lorica squamata, the Latin term for armor made from small scales. 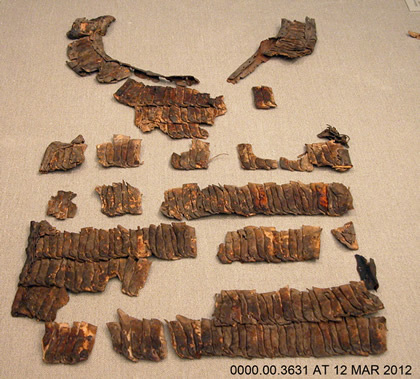 In most burial environments, organic materials like leather, textiles, and basketry deteriorate rapidly, but the dry conditions of Egypt help to preserve artifacts like this armor. The leather is extremely brittle, cracked, and torn, and individual fragments are buckled and deformed. There are areas of insect damage, and at some point in the past the leather was treated with oil. The leather armor during treatment. Conservation documentation revealed many details of the armor’s construction. 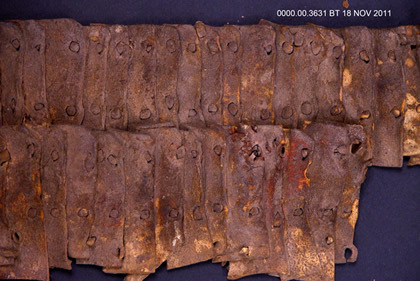 The small rectangular scales are sewn together with leather thong to form long horizontal rows. The reverse, or interior, of the armor is lined with thin leather. Another interesting feature is that many of the scales are a reddish color. Careful examination revealed that this red color was applied after the scales were sewn together, because it is not visible where the scales overlap. The red color was investigated with x-ray fluorescence spectroscopy (XRF). 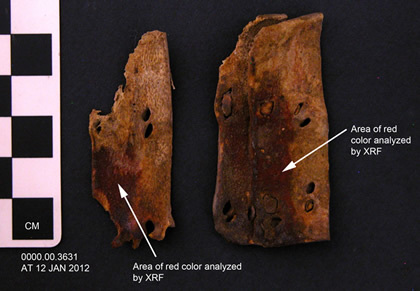 XRF measurements detected large amounts of iron, which suggests that these areas were colored with an iron-based pigment. Areas of red color on pieces of the armor. Conservation treatment for this artifact was minimal due its fragility. The leather is now too hard and too brittle to allow reshaping of the deformed fragments. To clean the leather, conservators used a soft brush and a low-suction vacuum cleaner. Soft cosmetic sponges were used to remove areas of resistant dirt, and barely moistened cotton swabs of 50:50 de-ionized water and ethanol were gently rolled over the surface to further remove dirt and grime. Care was taken not to over-dampen the surface to avoid the possibility of localized swelling or staining.